Are you passionate about the Pacific’s rich natural and cultural heritage? Do you want to work on innovative solutions to climate change? 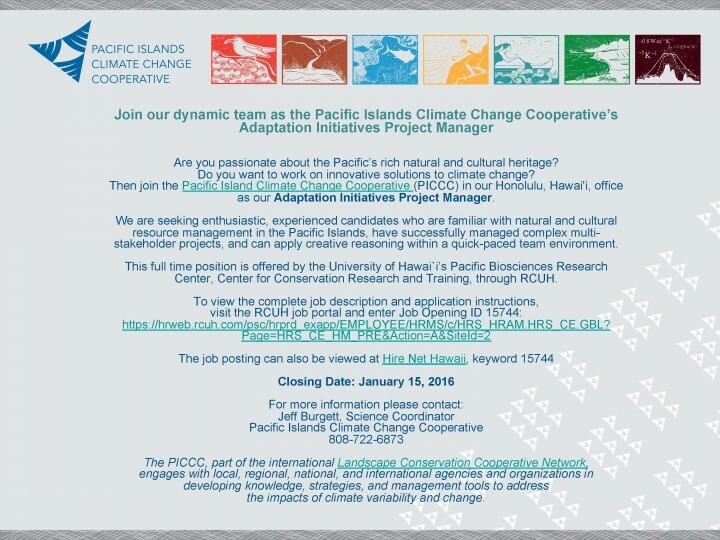 Then join the small but dedicated team at the Pacific Island Climate Change Cooperative (PICCC) in our Honolulu, Hawai’i, office as our Adaptation Initiatives Project Manager. We are seeking enthusiastic, experienced candidates who are familiar with natural and cultural resource management in the Pacific Islands, have successfully managed complex multi-stakeholder projects, and can apply creative reasoning within a quick-paced team environment. This full time position is offered by the University of Hawai`i’s Pacific Biosciences Research Center, Center for Conservation Research and Training, through RCUH. To view the complete job description and application instructions, visit the RCUH jobs portal and enter Job Opening ID 15744 (https://hrweb.rcuh.com/psc/hrprd_exapp/EMPLOYEE/HRMS/c/HRS_HRAM.HRS_CE.GBL?Page=HRS_CE_HM_PRE&Action=A&SiteId=2). The job posting can also be viewed at Hire Net Hawaii, keyword 15744. The PICCC, part of the international Landscape Conservation Cooperative Network, engages with local, regional, national, and international agencies and organizations in developing knowledge, strategies, and management tools to address the impacts of climate variability and change.